Well, the weather was better today - but still kind of overcast. Had breakfast at the Novotel and then hit the town. We walked into the old town and took some photos. 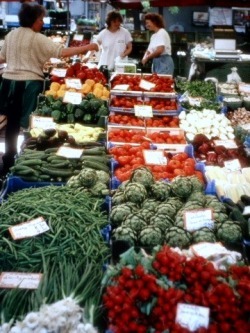 The marketplace was bustling with vendors and customers. Everything resembling fruit, veggies and meat was for sale. I took lots of photos of old Germanic-type women behind the stalls - we'll see how they turn out. Then we headed to the funicular for the trip up to Hohensalzburg, the medieval fortress overlooking the town. Walked around the fortress and had deja vu of 15 years ago when I was on the Young Columbus trip. Took some of the same photos as 15 years ago, including a sign on a narrow street that read "Steigel Keller" which I immediately recognized. Walked back down to the town and bought lunch in the market - chicken breasts (fried), Swiss cheese, some kind of flat pretzel and some kind of pastry bread (strudel?). Grapes too. Each from a different vendor. Then we headed out of town and drove up to the summit of Gaisberg. The view of Salzburg was nice going up, but at the top too foggy (again). Had our lunch overlooking the Fuchlsee and a blooming field of flowers. Then we took the Michelin scenic routes around "SOM" (Sound of Music) country - the Attersee, Monsee and Traunsee. The first two were rolling hills with chalets bordering on a deep blue lake. The last was more dramatic, with Yosemite-like cliffs plunging down into the water. Stopped and fed the swans, then headed south towards Hallstatt. 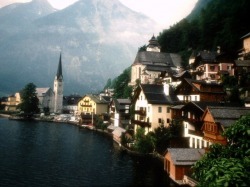 Hallstatt is a little town wedged between a sheer cliff with a waterfall and the Hallstatter See. It is very picturesque, as the houses are all sort of jumbled together from the cliff to the water with very narrow streets. 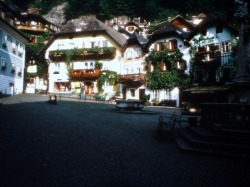 We parked and walked into town, checking in at the Gasthof Simony. The Simony is a great old place with creaking floors, and the WC and shower down the hall. The unfinished 2x12" floorboards have large gaps. Our room directly overlooks the Hallstatter See , with balcony and chairs. A million dollar view in a 2 bit hotel (actually about $40). We can see tourists on rented boats on the lake, the ferry, and the train across the lake that the ferry shuttles to (about 2 passengers per trip!). We ate dinner at the Gasthof Zauner. The Zauner soup was very spicy and good. We had an excellent bottle of Austrian wine; Jill had an ok steak and I had an ok smoked Reimnke, which was caught in the See and smoked in the restaurant. Grand Marnier, pancakes with chocolate syrup & nuts, and apple strudel for dessert. The camera bugged out again this afternoon - in the sun too long. Will take some photos tomorrow morning in town before the tourists arrive (by the busload). Looking forward to the view out the window tomorrow a.m.!